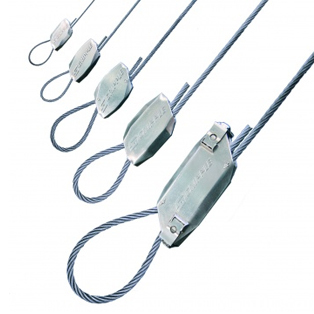 Cable hanger kit containing the original Gripple HangFast fastener, for suspending a variety of HVAC, piping, lighting, and electrical services. For the fast suspension of a variety of services, designed with an easy push-button release mechanism. It is the only Gripple Hanger available in sizes No. 1 thru No. 5, with Safe Working Loads from 25 thru 715 lbs per hanger. These hangers are ideal for fast suspension of any suspended service and is up to 6 times faster to install than traditional methods. It is versatile and simple to use as well as strong, safe, and industry approved. With its aesthetically discreet and lightweight feel, its fastener can be released with a release key to adjust or level the height of the service.